After last week’s Guardian focus on bargain places to eat in Leicester, there’s further media recognition for our restaurant scene this week. Channel 5’s series Street Chefs – which gets chefs to do live cooking in their local market – features Leicester tomorrow, Tuesday 9 November at 7.30pm. The format will see Tom Cockerill of Entropy and Simon Nurse of The Village in Newton Linford in a competitive cook-off with produce bought from the stalls around them. Now I know you will be excited about what they choose to cook so if you don’t wish know, please look away now. Tom goes for Rutland trout bonne femme followed by fillet of Longhorn beef and red Leicester rarebit, Simon for ballotine of chicken followed by local trout also with Red Leicester rarebit. Not sure I like the sound of all this cheese but it seems they were obliged to use it. 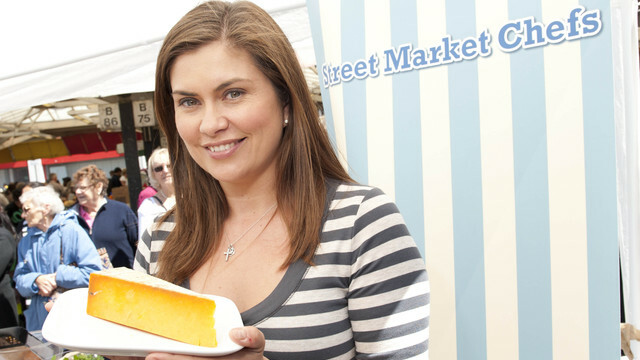 The show is presented by Amanda Lamb (pictured below with some, well, cheese) and judges include Aaron Patterson of Hambleton Hall, whom I can only assume Channel 5 think to be less photogenic. Shame. I hope the market comes out of it well – let me know you think. Many congratulations to Aaron Patterson and his team at Hambleton Hall which has been voted number 11 yesterday’s Sunday Times/Harden’s list of the UK’s top 100 restaurants. It’s a list based on customer feedback rather than critics and is thus bound to give a profound satisfaction. As will beating regional rival Sat Bains by two places – I once had a small role in helping Matthew Fort select chefs for BBC’ 2’s Great British Menu and tried to fight Aaron’s corner but the producers went for the big characters of Bains and Glyn Purnell rather than this unassuming but brilliant cook. It’s almost a year since I had dinner there – ﻿see the review – but the memory remains strong. Next time my ship comes in there’s a tidy sum earmarked to go again. Afraid the Sunday Times is behind Rupert’s paywall but those interested can check out the top 100 here. For thirty years now Hambleton Hall has been the pre-eminent restaurant in Leicestershire and Rutland. When I received a redundancy payment, the temptation to blow some of it on the work of Michelin-starred chef Aaron Patterson was too strong to resist. So it was that Sally and I drove up the Hambleton peninsula near Oakham, a finger of high ground that survived the creation of Rutland Water, and into the magical world of this definitive country house hotel. There’s no getting away from it, this is old-fashioned luxury. No concessions to modernist chic, it’s all 18th century paintings, ornate drapes, preternaturally squidgy sofas and a roaring log fire at every turn. Staff are numerous and, while veering towards the formal, extremely welcoming. We took drinks in what I suppose I can only call a drawing room, where the first treats came – a half dozen canapes including little bites of seabass and prawn, quails egg and so on. After ordering we’re invited into the dining room – thankfully no bling, but a quiet elegance, the napkins gratifyingly starched, the cutlery pleasingly solid. First an apology for a lack of photos – I did try but lighting conditions were difficult and I was far more concerned with enjoying the food than getting a decent image. There are set menus at £37 and £46 and a tasting menu at £60, but tonight we ventured a la carte. But before getting stuck in we had a further amuse of jerusalem artichoke soup – served foaming in a coffee cup it was stunningly powerful. It’s a strong distinctive taste – something of a shock to the palate on the first sip but you quickly get the hang of it and by the time it was gone you were desperate for more. Perfect. Sourdough and beer bread was excellent and, forewarned, they even managed to bring gluten free bread for Sally. She started with a simple salad, only it wasn’t so simple – beautiful fresh leaves, trimmed batons of cucumber with a really strong flavour, more quail’s eggs, big shards of a parmesan of rare intesity and a sweet truffle vinaigrette. I was hoping to revisit the extraordinary langoustines I had on a previous visit, but they weren’t on this evening. My good luck, beacuse the scallops I had were exquisite. The shellfish were gorgeous and sat in the midst of a epic collection of tastes and textures of onion. A supersweet onion puree, some lightly spiced marble-sized onion bhajees, port-braised shallots, crispy onion rings, and a foaming sauce flavoured with lemon grass. Everything on the dish earnt its place there, contributing in its own right and contributing to a greater whole. Hambleton is famous for its game and that’s where I was headed. Hare Wellington was perfect, rich and gamey meat wrapped in pastry with a thick layer of a gamey, nutty pate. Its sauce of prune and armagnac came in a cute little copper pan, as did an additional “hare bolognaise” – exactly as it sounds. The meat nestled on some greens with bacon, with further flavours coming from quince puree and superb baby vegetables – carrot, turnip and onions. Sally’s roast duck breast was of the highest quality, with couple of intense, complex sauces – one from meat juices, one dark and fruity. 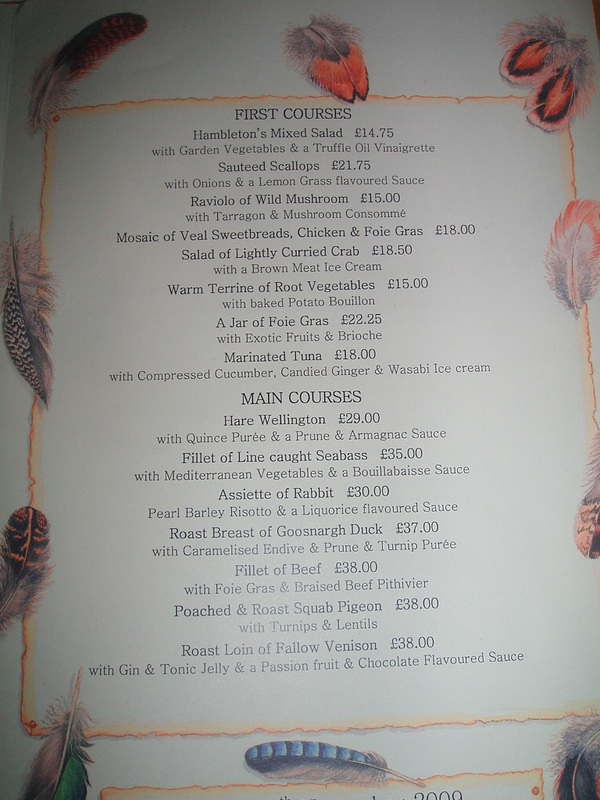 Oh yes the wine list, you could do some serious wallet damage there if you look too far down the substantial list – we had a glass each of a full-bodied Alsace pinot gris and a half-bottle of Pomerol which was excellent with the hare. To follow Sally had sorbets – a stunning-looking plate with I think seven sorbets, each presented a wafer thin crisp of its own fruit – banana, orange, apple, pear, pineapple, rhubarb, and coconut. My passionfruit souffle was a technical tour de force – so light and airy, yet so full of flavour, it was such a pleasure to eat. It came with a passion fruit stuffed with banana sorbet and a shot glass of passionfuit jelly with space dust topping. The food and the overall experience were, then, pretty much faultless. Of course by most normal standards it is ridiculously expensive, but here’s the thing. This was superb quality ingedients and highly-skilled, labour intensive cooking so you can see where the money has gone. I’d go back every week if I could. Booked in for dinner at Hambleton Hall at the end of November. Very excited. This extravagance will be covered by a combination of redundancy cheque and a tidy little bet placed last year on Leicester City to win League One. I’ve eaten Aaron Patterson’s food only once – an experience that was broadcast on the Great British Menu on BBC 2, but I don’t like to talk about it – and it was heavenly. The fattest langoustines I’ve ever seen with a clear tomato essence of rare intensity, plus an assiette of rabbit that was both technically spot on and fantastically flavoursome. I’ve met him on a couple of other occasions and he has always struck me as an extremely modest and pleasant man. I suspect the main reason he was not selected for GBM was not so much his food but that the producers felt they would get “better TV” by pitching the more upfront personalities of Glyn Purnell and Sat Bains into the kitchen together for a week. No disrespect to those two of course. Anyhow I’m hoping there will be some game on the menu. If anyone has been recently and wants to make some recommendations – please go ahead.